The BT-80 is the latest addition to iKey's expanding line of rugged tablet accessories and makes the perfect choice for enterprises which need enhanced tablet utility in harsh field conditions. In an emergency situation it's important to be able to rely on your equipment. During a fast response, sending and receiving data can make all the difference to a successful outcome. Consumer-grade computer equipment may not be up to the job—if it's vulnerable to dirt, moisture or extreme temperatures, there's always a chance it'll let you down when you need it most. It's essential to have kit that measures up to the most extreme demands you're likely to face. You need the new IK-TR-88-911-TP. In a hazardous environment consumer-grade computer peripherals will simply add to your problems—and if you're working in ATEX zones where there are risks of explosion, you definitely need keyboards that are certified as suitable. iKey has designed and produced a range of extreme keyboards that, as well as being FM-approved for ATEX zones, are virtually indestructible and tamper proof. For moments when your tablet needs to be a laptop! Diminutive in size and streamlined in design, the iKey SK-97-TP packs all the punch of a full-size keyboard - and it even does away with the need for a mouse with its integrated touchpad. It's slim and stylish, yet fully functional, user-friendly and extraordinarily resilient to all that a medical setting can throw at it. Traditionally, a hospital was somewhere you would go to when you were ill with the intention of coming out cured. Now we don't feel so sure… Hospital superbugs are constantly in the news and the latest figures show that 6% of UK patients pick up an infection when they stay in hospital—an infection which may, in some cases, be life threatening. So now you go in sick and risk coming out sicker! It's an easy guess as to what you're thinking when you read that headline: I'm not going to fall for that spend more, save more argument—it's just a sales pitch. But in fact, you'd be wrong. Over and over again, rugged keyboards have proved their worth over the cheaper alternatives. So when it's time for your next keyboard purchasing decision, take a look at the facts and not just the prices! 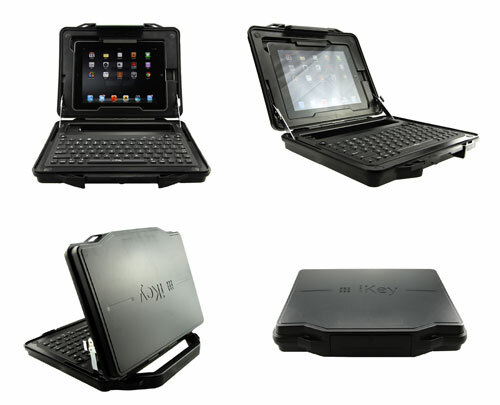 Recently unveiled at the 2013 Macworld/iWorld Expo, the iKey® StreetCase™ is a durable iPad case with an integrated keyboard that transforms iPads into rugged laptops. Not surprisingly, this unique peripheral has already stirred up a storm of interest. The benefits to users are obvious and it extends the functionality of the iPad into multiple situations. In the event you need an answer to a specific question that is not found on these pages, please do not hesitate to contact us using any of the methods below and we look forward to assisting you.